Q: Although my home has contemporary decor, I also like flowers and greenery. I'd like to create more warmth with my contemporary furnishings. Any suggestions? A: Live plants and greenery add coziness to any home. As do fabrics and accessories with texture. Try adding occasional pillows to your furniture, using a variety of sizes, patterns and textures. Or, drape a cozy woven throw over a favorite chair. A contemporary rug hung as "wall art" will also soften and add color to a stark contemporary setting without upsetting the balance of clean lines and proportion that are part of your look. Q: I love your hand-crafted items! Do you offer a catalog? A: I'm so glad you enjoy shopping with us. Because I present our items exclusively on QVC, I do not have a catalog. But, if you'd like an alternative to shopping via telephone, you can visit our boutique at qvc.co/valerieparrhillfb where we have lots of items you'll never see on TV! Q: I have a glob of wax on a favorite tablecloth. How do I get it out? A: As you can imagine, I've experienced that problem a few times myself! Begin by scraping off as much wax as possible with a dull knife. Then put several layers of brown kraft paper under the cloth and one on top. Using low heat, iron the stain until the wax is absorbed into the paper. If an oily spot still remains, dry cleaning should remove the residue. Q: I work as a geriatric social worker and have discovered a great way to decorate for the elderly in nursing homes or retirement centers. I encourage families to place a wreath or welcome slate outside a resident's door. This creates a homey environment for the individual and acts as a daily reminder of how much she is loved. What's more, like young people going away to college, retirement home residents often have difficulty making friends. A personalized door decoration catches the attention of all who walk by, creating an ice breaker and conversation piece. It can also ease the frustration of locating a room for residents and visitors alike. A: Thank you for a great idea! That's what Decorating from the Heart is all about. Q: I have a typical Cape Cod style home with a small dormer bedroom upstairs. How can I make the room look larger? A: I would choose as light a color as possible on every surface -- rug, walls, ceiling, bedding, furniture. In fact, try using all white or bone with one touch of color -- maybe a colorful floral wreath, a vintage style dresser painted a sunny yellow, or a red rocking chair. A monochromatic room with a splash of well-placed color will give you a charmingly fresh and airy look. Q: I have dried some hydrangeas to make a wreath. Is there a special product that I should use to keep them from shedding? A: Since the tiny petals on the hydrangea blossom are very fragile, especially when they're dried, take special care in working with them. I suggest a clear matte shellac spray (available at most craft and hobby stores). Be careful to hold the can a good distance from the blossoms when you spray them, as the force of the spray alone could cause some of the petals to fall off. 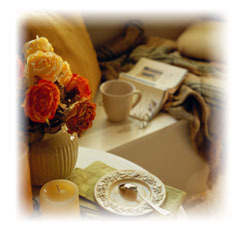 Q: How can I burn candles without the wax spilling over onto the candle holder or table? A: The best way to avoid drips and spills is to keep your candle away from a draft (like an open window or ceiling fan) which might cause the flame to burn unevenly and create a groove that allows the wax to drip over the side. For best results, burn a 3" pillar for no more than two hours, and a larger candle no more than three hours. Then allow it to cool. Also, I recommend trimming the wick to about 1/4" each time it is burned. Q: I live in an old double block home and have just finished a major remodeling job. The thing that I love most is the new open oak stair case. But now I have a large open wall that cries out for something. Help! A: I've been there! When Will and I lived in Texas, we had a similar stairway. My solution: I hung an heirloom quilt that had been Will's grandmother's. It worked wonders to warm up the space. I've also seen rugs used the same way very effectively. Simply choose a hanging with colors and patterns that work for you. Q: I am a 20-something career girl who lives alone. Unfortunately, my budget is limited. But I'd like to make my two-bedroom apartment more homey. (My second bedroom is an office). A: Just because it's an apartment, doesn't mean it can't feel like home! Paint is an easy, inexpensive way to put a personal stamp on your place. Nothing transforms a ho-hum wall like color. And, assuming you can do it yourself, it's a budget-smart way to add style. Don't be shy -- pick a color that's really "you"! Fabric is another way to get a designer look without a designer price tag. When Will and I moved into our first home, I had inexpensive round tables (the kind with the screw-on legs) in just about every room. If you sew, you can make the skirt and coordinating table topper in a jiffy. Then use the coordinating fabric to make pillows, fabric cornices or swags, even fabric-covered picture frames, lamp shades and chair cushions. Before you know it, the entire tone of the room is transformed. Beyond color and fabric, try to make your furniture options work for you too. When you shop, select pieces that are both functional and pretty -- like a blanket chest for a coffee table. Or country baskets that double as office caddies for paper clips, pencils, even "in" and "out" boxes. And don't underestimate the power of small touches. A grouping of candles adds color, scent and light. And a carefully placed eucalyptus swag (while not necessarily inexpensive) may be the special extra that gives your room a decorator touch. Most of all, remember to have fun -- that's the best way to add your unique touch to anything you create! Q: I want to jazz up my bedroom without spending a lot of money. Any suggestions? A: A nice way to introduce a unifying touch is to add a chair rail and pretty wallpaper border. I love to use mirrors too. I've found beautiful gold frames at local craft stores, then had a piece of mirror cut to fit the frame. For a relatively small sum, you have a lovely accent. If you already have a large bureau mirror, try a grouping composed of family photos, framed needlework (original pieces, gifts or family heirlooms) and a floral item like a bouquet or wreath. Q: I just purchased my first computer and need to buy a computer desk, but I want my office/ third bedroom to be a warm, comfy place to work. Do you have any ideas? A: To keep your home office warm and inviting, select wood instead of metal furniture. And, consider an area rug in warm colors to give your office personality. Q: Do you also do crafting yourself? What is your favorite thing to make? A: Between my family and the shows I do on QVC, it is difficult to find time for hand crafting. For years I loved to needlepoint and petite point. A favorite project was to needlepoint a new baby's name on a tiny pillow and add a little pocket on the back for the tooth fairy. These days, most of my crafting is done in my studio -- working on many of the items you see on QVC! Q: How long do dried floral wreaths last? A: How long a wreath will last varies a bit depending upon the specific flowers and greens used to make it. However, when kept out of direct sun, which may fade some flowers just as it does upholstery, and when kept away from excessive moisture, which will damage freeze-dried flowers, your wreath should last long after you've tired of it. To keep a wreath -- or any floral accessory -- fresh looking and dust free, try a blow dryer. Using the lowest setting, hold the blow dryer six to twelve inches from the piece and gently blow the dust away. Q: I love decorating with dried flowers, but don't want my home to look like a florist. How many floral combos -- wreaths, swags, arrangements -- are too much? A: A big part of decorating from the heart is expressing your own unique style. The right way is the way that feels best to you. I like to express my individuality with flowers so, as you might imagine, my home decor includes quite a few floral accents. My advice: let yourself go! You'll know whats right. Q: Last September I sent a dried rose wreath to my niece. When I visited her home recently, I saw that it was proudly displayed on the dining room table. In the center was a simple crystal vase of flowers. It made an elegant presentation. A: Great idea! Wreaths aren't just for walls. They make beautiful centerpieces that can be dressed up or dressed down to suit just about any occasion. Mini wreaths also make lovely candle rings, window decorations, package decorations (instead of ribbon bows), even Christmas ornaments. Q: I enjoyed your recent show on QVC. Unfortunately, I work during the day so I watched it on tape and was disappointed that some of the items I would like to have purchased were sold out. A: Thanks so much for watching. If an item you'd like to order is sold out, you can call QVC Customer Service at 1-800-367-9444. They may be able to put your name on a wait list for prompt shipment as soon as supplies are available. The wait list option is available even if an item sells out while you are calling in. Just stay on the line and a representative will help you. Q: Where can I find your products? I have only one Heartfelt and Hand-Crafted item -- a wreath -- and love it so much that I want more! A: "Valerie" products are available exclusively on QVC. For a list of upcoming programs, keep your eye on the See You Soon section of our website. Q: I'm searching for ideas for our home's entry. I would like to do something with Early American/Victorian flare. The woodwork has a walnut stain and the inside of the door is a dark brown. We've considered changing it to a neutral cream. There are also two large doorways to other rooms on either side of the front door. Any suggestions? A: Your idea to paint the inside of the door a neutral cream is great. You won't believe the difference a light color will make. Drawing attention to doorways gives the illusion of more space. What would you think of doing a stenciled arch of ivy and flowers over each doorway? A sweeping eucalyptus arch above each door might also work with your Victorian decor. Or try a border at the ceiling to take the eye upward. This, too, will create visual space. Another decorating trick is to use mirrors. Find the largest wall in your entry way and hang a nice size mirror (don't be timid!). If the wall can accommodate one, a slim table beneath the mirror will help "anchor" it to the wall.